(Wiki) Daniel Huntington (October 4, 1816 – April 19, 1906), American artist, was born in New York City, New York, the son of Benjamin Huntington, Jr. and Faith Trumbull Huntington; his paternal grandfather was Benjamin Huntington, delegate at the Second Continental Congress and first U.S. Representative from Connecticut. He studied at Yale with Samuel F.B. Morse, and later with Henry Inman (painter). From 1833 to 1835 he transferred to Hamilton College in Clinton, New York, where he met Charles Loring Elliott, who encouraged him to become an artist. He first exhibited his work at the National Academy of Design in 1836. Subsequently he painted some landscapes in the tradition of the Hudson River School. 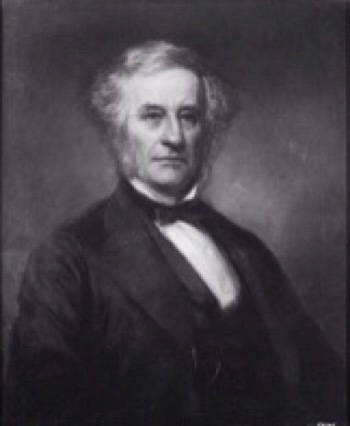 Huntington made several trips to Europe, the first in 1839 traveling to England, Rome, Florence and Paris with his friend and pupil Henry Peters Gray. On his return to America in 1840, he painted his allegorical painting “Mercy’s Dream”, which brought him fame and confirmed his interest in inspirational subjects. He also painted portraits and began the illustration of The Pilgrim’s Progress. In 1844, he went back to Rome. Returning to New York around 1846, he devoted his time chiefly to portrait-painting, although he painted many genre, religious and historical subjects. 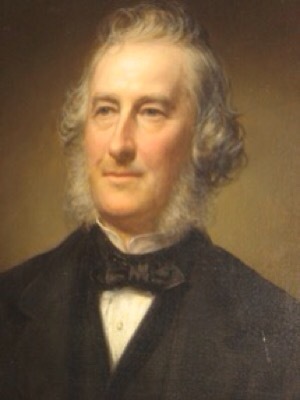 From 1851 to 1859 he was in England. He was president of the National Academy of Design from 1862 to 1870, and again in 1877-1890. He was also vice president of the Metropolitan Museum of Art. (Jay Heritage Center Collection) The line and stipple engraving above is one of several recent gifts made to the Jay Heritage Center this month. The antique print was produced by A.H. Ritchie in 1867 and based on the original 1861 painting by Daniel Huntington titled “The Republican Court.” Huntington’s painting, was completed at the beginning of the Civil War; the scene harkened back to what was seen in hindsight as a more harmonious time between the states — the founding of our union –and it represented an idealized assembly of the leaders of that period (Northern and Southern) in a European, court like setting. The image prominently features John Jay, John Adams and Alexander Hamilton on the left, Martha Washington on the dais, Thomas Jefferson and George Washington center ground and Sarah Livingston Jay on the far right and many other familiar personages of the Revolutionary War. 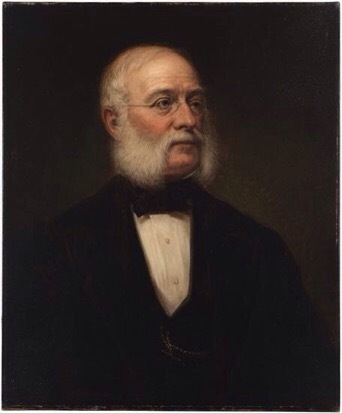 Daniel Huntington (1816 – 1906) won acclaim and prominence as the favored portraitist of New York Society after the Civil War. Though he was equally skilled at genre works and Hudson River style landscapes, he is best known for his likenesses of presidents, statesmen and other distinguished Americans including his painting of Abraham Lincoln that hangs at the Union League Club in Manhattan where the Jays were also members. Huntington’s training included studying with Jay family colleagues like John Trumbull (who is pictured in the engraving above), and Samuel F. B. Morse, then president of the National Academy of Design, whose successful career as an artist preceded his renown as an inventor. Huntington’s leadership roles in the artistic community were many: he was a member of the National Academy of Design for most of his life and served as its president for 22 years (1862 – 1870; 1877 – 1891). He was a founder and president of the Century Association and as vice-president of the Metropolitan Museum of Art for 33 years, he helped that institution expand and grow in stature. 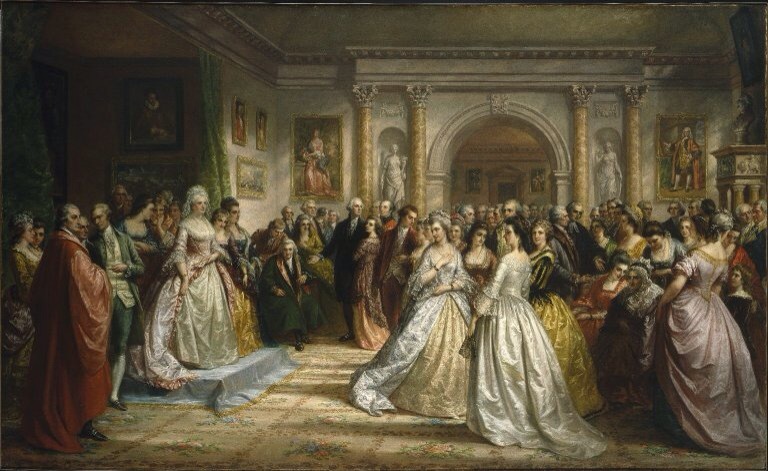 Differentiating it from the painting, the popular steel engraving was retitled “Lady Washington’s Reception” and a key identifying each of the 64 individuals shown was printed in magazines and newspapers of the time. Mary Clarkson was the only child of General Matthew Clarkson and Mary RUTHERFURD. 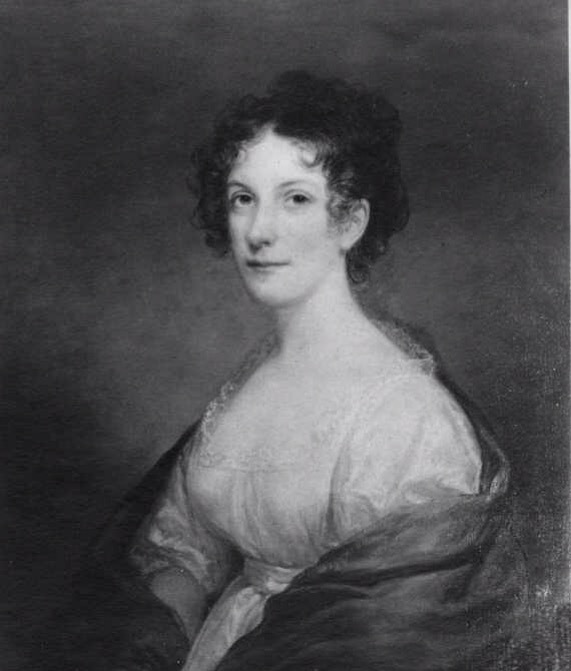 She married Peter Augustus Jay, the oldest son of John Jay and Sarah Livingston. They had seven children almost all or their spouses were also painted by Daniel Huntington! He was the son of Peter A. Jay and grandson of Founding Father John Jay, diplomat, first Chief Justice of the United States and two time Governor of New York State. J. C. Jay graduated from his father and grandfather’s alma mater Columbia in 1827, and from the College of Physicians and Surgeons in 1831. In addition to his practice of medicine, he made a specialty of conchology, and acquired the most complete and valuable collection of shells in the United States. This and his costly library on this branch of science were purchased by Catherine Wolfe and presented, in memory of her father, to the American Museum of Natural History, where it is known as the Jay Collection. He married Laura Prime (1812-1888) and they had seven children that lived to adulthood. Laura Prime’s father was Nathaniel Prime, a prominent NY banker and one of the wealthiest men in the colony. 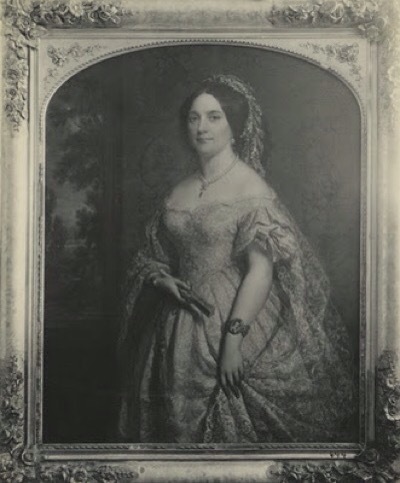 Her brother Frederick Prime married Mary Rutherfurd Jay, John Clarkson Jay’s sister. After the death of his father in 1848, when he was 35 years of age, he moved from his home in New York City on Bond Street to the house in Rye, that his father had rebuilt and lived there with his wife Laura for the rest of his life. Sitter: Alice Jay. Date about 1900. Oil on canvas. Given to the Jay Heritage Center in 2012. The Jay Heritage Center (JHC) recently received an extraordinary gift from one of John Jay’s descendants. 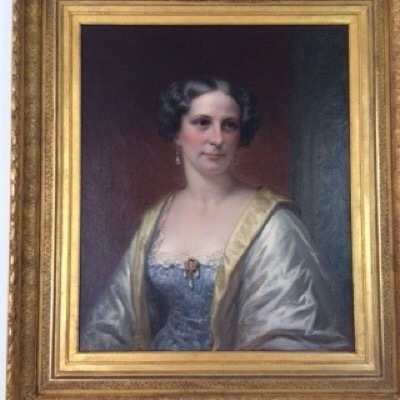 In celebration of the continued restoration of the 1838 Jay House in Rye, Ada Hastings of Great Barrington, Massachusetts and her family magnanimously donated a portrait of John Jay’s great granddaughter that once hung in the mansion’s Drawing Room. The painting will be unveiled to the public for the first time on May 15, 2011. ANNA MARIA JAY** Birth 12 Sep 1819 in New York City, New York, Death 2 Jan 1902 in Brooklyn, Kings, New York, married HENRY EVELYN PIERPONT Birth 8 Aug 1808 in Brooklyn, Kings, New York, Death 28 Mar 1888 in Brooklyn, Kings, New York, They had six children. Frederick I. Prime, a Son of Nathaniel Prime and Owner of Edgewood Frederick I. Prime attended Yale, studied law and was admitted to the bar of the State of New York as a young man. He married his first wife, Mary Rutherfurd Jay, and entered practice with her father, his new father-in-law, Peter A. Jay who served as Recorder of New York City. 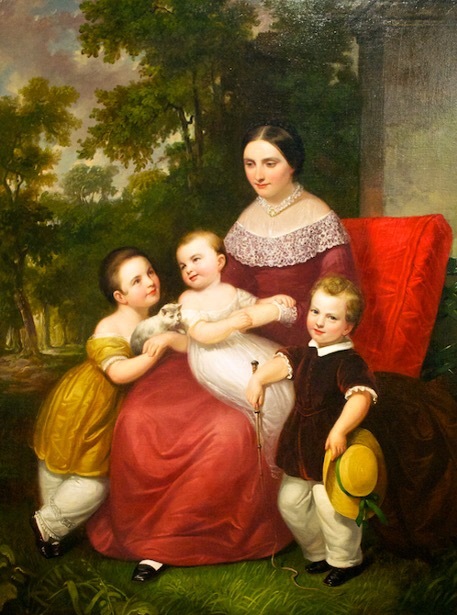 Frederick and Mary Prime had three children before Mary died on September 9, 1835. (She is buried in the Jay Graveyard in Rye, New York.) Their children were Mary Rutherford Prime, born in New York on August 24, 1830; Harriet Prime, born in New York on September 11, 1832; and Helen Jay Prime, born in New York on August 22, 1835. 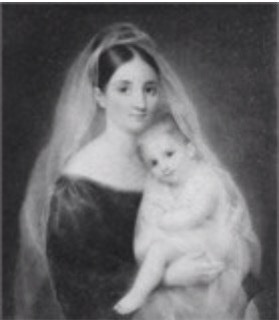 Frederick Prime’s wife, Mary Prime, died only eighteen days after the couple’s third child was born. Sitter: Mrs John Jay, II wife of JJ II, oil on canvas, hangs at the Jay Homestead in Bedford. Eleanor Kingsland Field was the daughter of Hickson Field, of New York. She married John Jay II in 1837. The miniature she wears on the bracelet on her left arm is said to be that of her son, William Jay (1841-1915). bio: John Jay II was a man of several occupations including diplomat, abolitionist, farmer, lawyer and public service. He was a member of the Jay family, one of the most prominent in New York State and American history. John was very devoted to many causes along with having a strong moral compass, great integrity and a gentle persona. He was born in 1817. John was the third of eight children born to William and August McVickar Jay and a grandson of John Jay, the first Chief Justice of the United States Supreme Court. He was raised with five sisters while another brother and sister died very young and enjoyed a childhood of privilege and happiness. As his father and grandfather before him, John also received a classical education in the highest tradition. When John was fifteen, he began studies at Columbia College in New York City and ranked second in the class of 1836. He began legal studies in New York City after graduation and entered the bar in 1839. John practiced law for the next nineteen years until his father’s death in 1858. After retiring from his law practice, he pursued his favorite causes and ran the family businesses. John provided a life of comfort and ease for his family. He married Eleanor Kingsland Field, a strong willed woman, in June 1837 at the Jay home in Bedford, New York. They enjoyed 57 years of marriagealong with a “Jaybilee,” a celebration of their fiftieth wedding anniversary. 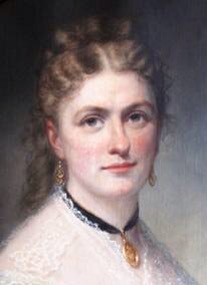 Sitter: Mrs Alexander Jay BRUEN, oil on canvas. Alexander Jay Bruen, B.A. 1878. Born August 10,1855, in Newport, R.I. Died February 25, 1937, in New York City. Father, Alexander McWhorter Bruen (B.A. Rutgers 1836; M.D. Columbia 1836); son of Mathias and Hannah (Coe) Bruen. Mother, Louisa (Jay) Bruen; daughter of William Jay (B.A. 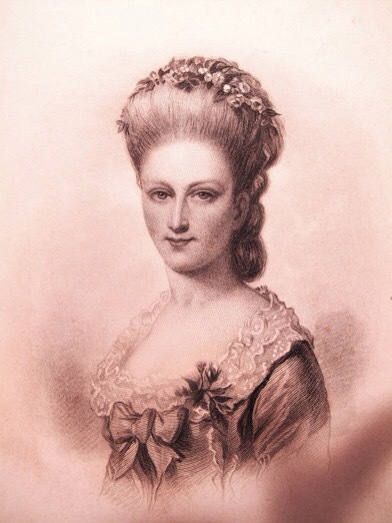 1807) and Hannah Augusta (McVickar) Jay. Yale relatives include: Peter A. Jay, hon- orary M.A. 1798 /(fflgtt«ncle); W. Livingston Bruen, ’79 (brother); Attended scho||WHH|^Hwk City, Paris and Nice, France, and Dresden, Germarrj^jpS^wHoquy appointment Senior year; mem- ber Dunham Boat Club, Gamma Nu, and Linonia.« Attended Columbia Law School («r-i88o); practiced law independ- ently m New York City until retirement in 1927; author: Our Charities and Bow ‘They are Managed; member St. James Presbyterian Church, New York City. Married June 19, 1907, in Little Silver, N.J., Constance Louise; daughter of Edward Charles and Eliza Winthrop (Carville) Fiedler. Children: Alexander Jay, Jr., ’32; Edward Fiedler Livingston; Con- stance Louisa Jay Fiedler; and Evelyn Louisa. Mrs. Bruen died Novem- ber 25> l93S- Death due to pneumonia. Buried in Jay Cemetery, Rye, N.Y. Sur- vived by children. He was born in New York City, and graduated from Yale in 1808. After his graduation, he took up the management of his father’s large estate in Westchester County, New York, and also studied law at Albany. Poor eyesight soon compelled him to give up the legal profession. He early became interested in various philanthropic enterprises and reforms and identified himself especially with the temperance, antislavery, and antiwar movements. He was one of the founders (in 1816) of the American Bible Society, which he defended against the vigorous attacks of the High Church party, led by Bishop Hobart. He was judge of common pleas in New York from 1818 to 1820, and was first judge of Westchester County from 1820 to 1842, when he was removed on account of his antislavery views. This entry was posted in Jay Family History, Jay Heritage Center and tagged Daniel Hunington on November 22, 2015 by jsdubois28.